Coming to Borer Chiropractic was the best decision I've made!!!! I am so grateful to Dr Borer for being such an outstanding chiropractor!! This is the first time in over 4 years that I have been virtually pain free!!! My orthopedist had me scheduled for a spinal fusion, and being reluctant to surgical intervention,decided to give chiropractic care a shot for the first time. After just THREE visits I no longer require surgical intervention and my quality of life has improved DRASTICALLY!! Honestly, in three visits, Dr. Borer has done more to fix my spine and nerves than 4 years at a state renowned orthopedist and multiple specialists. I am forever grateful to Dr Borer for helping me and I couldn't be happier with the results. I had been to doctors for years for neck, chest and shoulder pain. I had numerous tests and treatments, with no relief. I decided to go to Borer Family Chiropractic and finally received some answers. Once Dr. Rob started straightening out the misaligned vertebrae in my neck all aspects of day to day life have gotten better including at work and performance in the gym. When I first came to Borer Family Chiropractic, I had been suffering with chronic neck pain for twenty years. Over the last six months, not only has my neck pain lessened, but I also have a greater range of motion in my neck and a better sense of well being. Thank you Dr. Rob! After five years of chronic neck and back pain I have finally found relief. Two extended physical therapy attempts never produced the results I have experienced after a few short months of seeing Dr. Rob Borer. Since starting care at Borer Family Chiropractic the pain in my upper spine and neck is all but gone, the feeling in my arms has returned, and my fingers have stopped tingling. I no longer throw my head from side to side in order to crack the stiffness out of my neck. The TMJ, headaches, and earaches are gone. I truly wonder how I ever functioned before my treatment began. Thank you Dr. Rob for being there when I needed you most. After many years of neck pain and headaches, due to an accident, I needed to find some relief. After only three visits to Borer Family Chiropractic, I was feeling relief from the neck pain and the headaches were gone. As an added bonus, I also gained mobility in my shoulder, which had also been injured in the accident. What a joy to be relieved of the pain that could have been a burden for the rest of my life. For much of my adult life I have suffered from upper back an grinding neck pain. I had limited neck mobility as a result and the more time went by the worse the pain got. 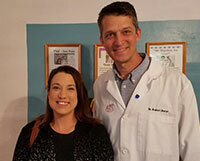 After seeing several other chiropractors and medical doctors and trying numerous medications that my body couldn't tolerate, I came to Borer Family Chiropractic. Very shortly after starting Upper Cervical care with Dr. Borer I noticed a difference. I now sleep much better, am more relaxed, and have improved neck mobility and significantly less neck pain. My neck and upper back have bothered me for years. I could never paint a ceiling or do anything overhead without pain. I have tried exercise, physical therapy and pain meds, but never had good results. Finally, after receiving care at Borer Family Chiropractic I can do so much more than I ever was able to before. I do not have insurance so it was a leap of faith to try chiropractic. Worth every penny! I started care at Borer Family Chiropractic because of a stiff neck that had been bothering me for over a month and the migraines that invaded my life three or four times a week. After only two months of care with Dr. Borer, my stiff neck is gone, as well as the migraines. My lower back is no longer bothering me like it used to, and I'm sleeping much better. I feel better all around!